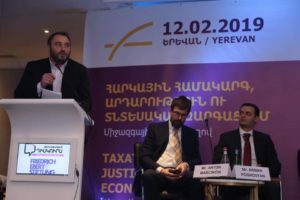 The International conference “Taxation, Justice and Economic Development” was held in Yerevan on 12th of February 2019 on the eve of expected reforms in Armenia’s tax system to discuss reform challenges and horizons jointly with experienced international experts, representatives of finance ministries and political figures of different countries. High-level guests from Macedonia, Slovakia, Germany, Georgia, and representatives of the Government of Armenia and various circles arrived in Yerevan. 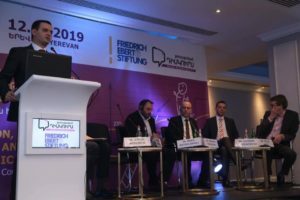 The event was organized by Friedrich-Ebert-Stiftung (FES) Foundation (Germany) and Political Discourse (Diskurs.am) Journal. The key focus was on comparative advantages and disadvantages of progressive and flat income taxation systems. Download other useful materials about the main topic of the conference here. Macedonia adopted a flat income tax in 2007. The country reduced the profit tax rate from 15% to 12%. Afterwards, the profit tax rate was reduced for additional two percent, down to 10%. This was justified with the argument that lower profit tax for companies would stimulate business operations, thereby stimulating economic growth and overall, would simplify administration procedures. During the last ten years the mentioned taxation reforms did not lead to a significant economic progress. Moreover, they have been directly associated with detrimental societal consequences, in particular the meteoric rise in inequality. Macedonia’s Gini coefficient has skyrocketed, and the country has become one of the most unequal countries in Europe. At the same time, the combination of overall tax reduction happened simultaneously amidst an era of a significant increase in public spending. 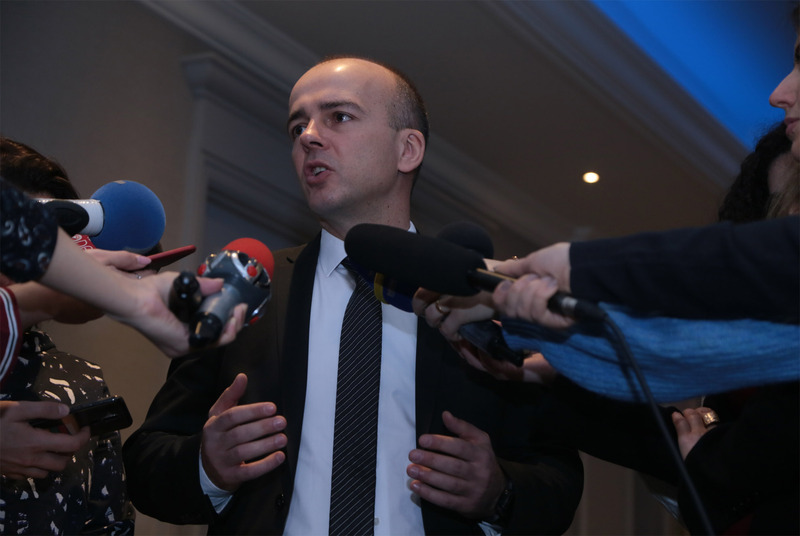 After 10 years of 10% flat personal income tax rate in Macedonia the new SDSM-government recently introduced the Law on progressive personal income taxation which became effective as of 1 January 2019. There will be a progression on incomes of labour with two tax rates: 10% and 18%. The threshold for the second marginal rate is about 1,500 euros per month. The aim of the reform is to create a fair tax system. Slovakia made a transition from the progressive system to 19 percent flat income tax in 2004 and returned back to the progressive system in 2013. The results of this short period of applying flat income tax are contentious. Statistical data suggest that the budget revenue increased significantly after eliminating the flat rate and returning to progressive income tax (reaching 40 % of GDP from 34 % between 2013 and 2015). Currently, neither the governing party in Slovakia nor the opposition consider the possibility of applying flat tax, and share the same view regarding the appropriateness of the progressive tax system. In 2004 when the German economy was facing a period of difficulties, Professor Paul Kirchhof, who had developed a conceptual framework for introducing a flat income tax and boosting economic growth, joined the economic team of the governing Christian-Democratic party before the elections. The proposal was subject to wide public discussions. A series of research showed that the reform would result in major redistribution to the detriment of low income earners. Given the circumstances Germany refused the idea of the flat income tax. The German economy started to grow again during 2005 without carrying out tax reforms. Since 2003, the Georgian government under Mikheil Saakashvili reduced the number of taxes to a minimum in order to achieve tax efficiency in Georgia. It has been largely regressive, which means that the tax burden falls primarily on low income households. Georgia operates a flat tax system with respect to income tax. The Constitution Law of Georgia on Economic Freedom reads as follows: “It is prohibited that the subject of the referendum should be progressive taxation principle or methodology/taxation regime.” Currently Georgia is leading in the post-Soviet countries in terms of inequality. 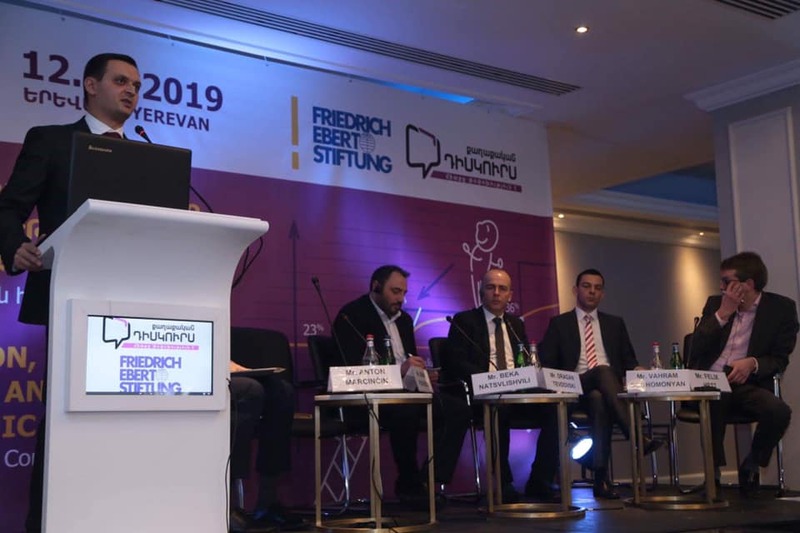 After the velvet revolution in 2018, the RoA Prime Minister elect Nikol Pashinyan presented two options for income tax reform to the public in September – progressive and flat. During the past months these proposals have been a subject of heated discussions. The first option proposes introducing a two-tier system of 20 % and 25 % rates under the progressive system. The RoA Ministry of Finance outlined 9 different scenarios selecting the flat income tax of 23 percent with an intention to reduce it to 20 percent in future years. This option is contentious because out of approximately 600,000 taxpayers it contemplates tax burden alleviation only for high income earners. Whereas nothing changes for those who earn salaries below 150,000 AMD (270 EUR). And the perspective of increasing consumption taxes is another drawback for them. The critics of flat taxation also indicate that the principle of solidarity is endangered, that significant budget losses are expected and point out negative examples internationally, where income inequality has increased affecting economic growth. 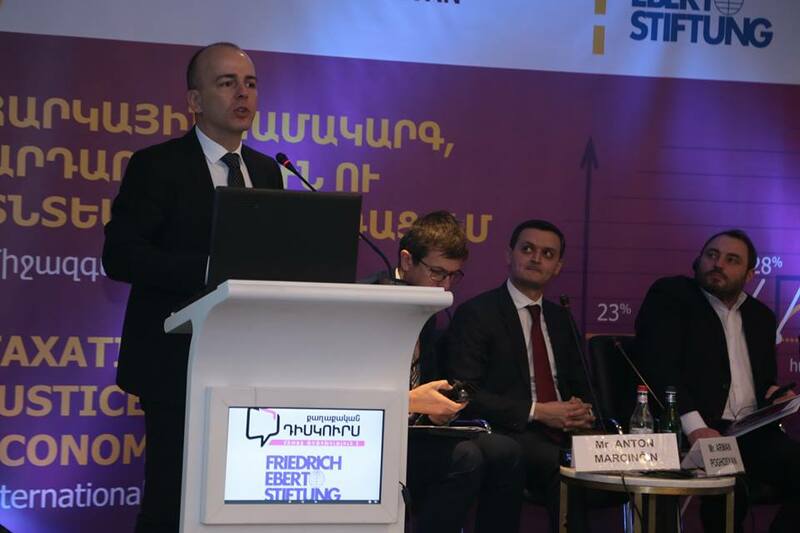 Tax administration enhancements, labour productivity increases and ensuring justice in taxation are of key importance in the context of Armenia’s tax reform. According to expert views, not only wage taxation progressivity but in general a gradual transition to progressive taxation of all income by providing tax deductions to low income earners, could be appropriate for a truly progressive system. 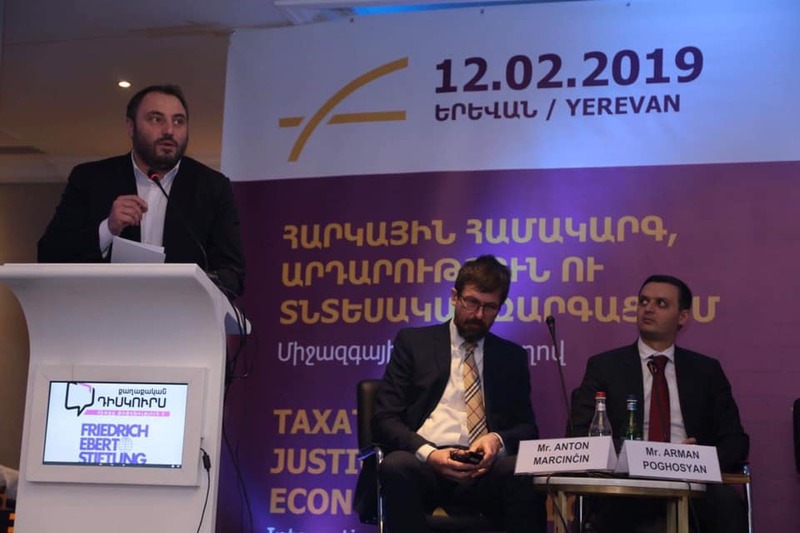 The proposed reform package of tax reforms in Armenia was presented by the Deputy Finance minister Arman Poghosyan. A discussion about the controversial issues of the income tax regulations was held. Video materials of the discussion will be published soon. IMF (2014), Redistribution, Inequality, and Growth, Jonathan D. Ostry, Andrew Berg, and Charalambos G. Tsangarides, April 2014. “The fourth area of an effective policy strategy to curb high inequality relates to taxes and transfers. These policies constitute the most direct and powerful instrument to redistribute income. Most OECD countries make substantial use of income taxes and cash transfers to reduce income gaps. On average, income inequality among the working-age population is reduced by 26% in the OECD and by 30% in France and Germany, compared to 19% in the United States and 4-5% in Chile and Mexico. In most emerging economies, the effect of such redistribution is much weaker, often linked to lower levels of per-capita social spending and less effective taxation due to a high level of informality. At the same time, as in OECD countries, social spending on in-kind transfers – services such as education and health – also tends to lower inequality. Dragan Tevdovski became Minister of Finance of Republic of Macedonia in June 2017. He is an Associate professor at the Faculty of Economics, University “Ss. Cyril and Methodius” in Skopje. Under his leadership, he initiated various reforms to enhance transparency and efficiency of public spending, boosted the country’s economy and speeded up the integration process towards the European Union. Some of the key achievements of the Ministry over the past year and a half include: stabilization of the budget deficit and public debt, improvement of public finances, transparency and accountability as well as adoption and implementation of a comprehensive Public Finance Management reform programme. 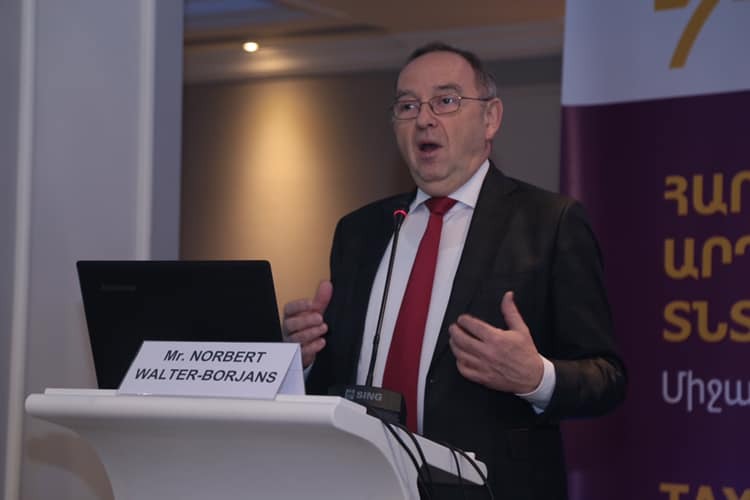 Dr. Norbert Walter-Borjans was born in 1952 in Krefeld (Nordrhein-Westfalen, Germany). He studied Economics at Bonn University (1971-1978) and Product Management by Henkel KGaA Düsseldorf (1978-1980). After graduating he worked as Academic Assistant and then taught Economic Theory at the University of Cologne (1980-1984), where he became Doctor of Economics (1982, Dr. rer. pol.). 1984-1991 he worked at State Chancellery (NRW, Düsseldorf) and was responsible for Structural Change Research and Policy. He was the Spokesman of the Land Government and Prime Minister Johannes Rau (NRW, Düsseldorf). His political activities continued as Secretary of State at the Ministry of Finance and Economic Affairs in Saarland (Land Saarbrücken, 1998/1999), where he became Consultant for Economics and Communication (1999-2004). 2004/2005 he was Secretary of State at the Ministry of Labour and Economic Affairs (NRW, Düsseldorf), then consultant for Economics and Communication (2005/2006). As a member of the City Board he was responsible for Economy, Real Estate and Finance in Cologne (2006-2010). In 2010 he became Minister of Finance (Land Nordrhein-Westfalen) and was in the post till 2017. He is author of many publications and has been active as a Consultant since 2017. 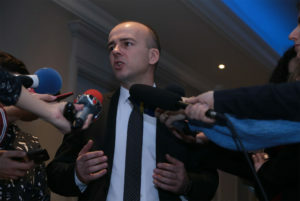 Anton Marcinčin (1968), advisor to the Finance Minister since 2012 specializes in public finance management, labour market and regional development. 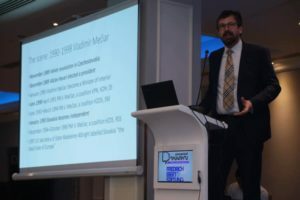 After graduating from ČVUT Prague and CERGE-EI Prague, and undertaking research fellowships at Tinbergen Institute and LSE he defended a Ph.D. in economics at Charles University (1999). He published tens of research articles, lectured at several universities and participated in many international research activities. As a country economist of the World Bank for Slovakia and Slovenia (2000-2008) he participated in restructuring programs of enterprises and banks, public finance management and reports on living standards and labour market. He was the Vice-President of Christian Democratic Party and Member of the Parliament (2010-2012), advisor on Roma issues to Vice-Prime Minister and Minister of Interior (2012-2015) and advisor to Minister of Education (2015-2016). At Ministry of Finance led activities aimed at improving business environment – Doing business – and regional development, increasing capacities of kindergartens and elementary schools, and creating a network of health assistants in poor Roma communities. As the Government Plenipotentiary for poor regions and General Director for regional development (2016-2018) established conditions for participatory and complex approach to governing regional development with a special focus at 12 poorest districts. He publishes regular columns in the Slovak Economic Daily (2007). Download the PDF-file of the conference brochure here. You can find this article in Armenian here.